Toward the end of this period, Parker began to become more politically aware and active. What would become a lifelong commitment to activism began in 1927 when she became concerned about the pending executions of Sacco and Vanzetti. Parker travelled to Boston to protest the proceedings. She and fellow Round Tabler Ruth Hale were arrested, and Parker eventually pleaded guilty to a charge of "loitering and sauntering", paying a $5 fine. ^ Chambers, Dianne (1995). "Parker, Dorothy". In Wagner-Martin, Linda. The Oxford Companion to Women's Writing in the United States. Oxford University Press. ^ "Edwin P. Parker 2d". The New York Times. Associated Press. January 8, 1933. Retrieved 2013-02-28. ^ a b Gottlieb, Robert (7 April 2016). 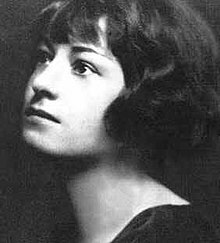 "Brilliant, Troubled Dorothy Parker". New York Review of Books. Retrieved 23 August 2018. ^ The Columbia companion to the twentieth-century American short story. Gelfant, Blanche H., 1922-. New York: Columbia University Press. 2000. ISBN 9780231110983. OCLC 51443994. 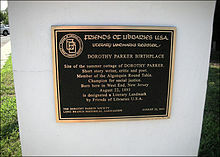 ^ "Dorothy ParkerR Writer, Versifier". Red Channels: The Report of Communist Influence in Radio and Television. Counterattack. Archived from the original on 2007-08-07. Retrieved 2007-09-24. ^ James Malanowski (July 17, 1959). "Dead & Famous; Where the Grim Reaper has Walked in New York". Spy. Retrieved 2013-04-10. ^ Itzkovitz, Daniel (May 28, 1998). "Dorothy Rothschild Parker (1893–1967)". Jewish Virtual Library. Retrieved 2005-09-25. ^ Heller Anderson, Susan (September 20, 1987). "City Makes It Official: Algonquin is Landmark". The New York Times. Retrieved 2007-10-21. ^ Crusie, Jennifer, ed. (2007). "Palladino on naming her company". Coffee at Luke's: An Unauthorized Gilmore Girls Gabfest. Dallas: BenBella Books. p. 185. ISBN 1-933771-17-8. Retrieved 2012-08-24. ^ Duarte, Amanda. "'RuPaul's Drag Race' Season 10, Episode 7: Citizens Divided". The New York Times. Retrieved 5 May 2018.